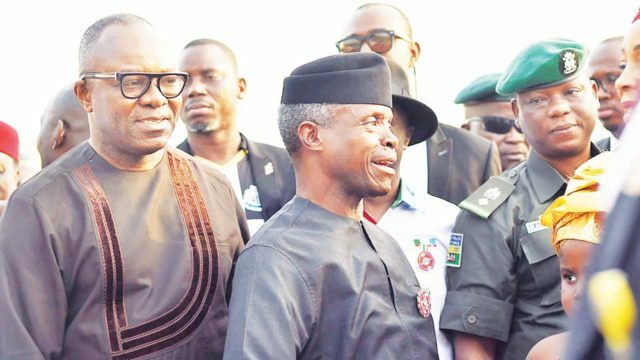 Vice President Yemi Osinbajo has urged Nigerians not to listen to empty promises as the 2019 general election draws near, saying that citizens should rather focus on critical issues of development the current administration have tackled in the last few years. The vice president spoke, yesterday, during his door-to-door campaign for the 2019 general election at the palace of Seriki Hausawa of Agege, Lagos, Alhaji Musa Muhammed Dogonkadai. He reassured the people that the President Muhammadu Buhari administration is not relenting on addressing issues of poverty and unemployment in the country. This is just as Lagos State gubernatorial candidates of African Democratic Party (ADP) and Abundant Nigeria Renewal Party (ANRP), Mr. Babatunde Gbadamosi and Mr. Abiodun Dabiri, respectively, have urged Lagosians to consider next year’s governorship election as a project that must be executed to achieve freedom from the clutches of the ruling All Progressives Congress (APC). Both candidates noted that until Lagosians decide to free themselves through the ballot, which is the only peaceful means of extricating from the stranglehold of one man and his political party, it is absolutely useless to lament or make noise. Gbadamosi, who pledged to assist victims of the Abule Egba area pipeline fire incident during a visit to the scene, said he was moved with passion when the disaster occurred, especially at a time of bad economic situation. “The assistance I want to render is to help bring some succour to some of the victims,” he said, just as he flayed APC for doing less in the last 20 years, yet seeking the support of Lagos citizens in the next election. The ADP candidate said if Lagos is ranked as the fifth largest economy in Africa, “where there are countries like Egypt, South Africa, Nigeria, Liberia and others all of which are funding their military, airports and sea ports, among others, we should then ask questions from our leaders in Lagos why education, health system, road infrastructure and others are what they are at present in our state being the fifth largest economy? He said there was need to step up action on vandalism in the state to forestall loss of lives and property, stressing that if elected governor, he would ensure that more persons are recruited into the Lagos State Neighbourhood Corps to complement the efforts of security agencies in the state. On his part, Dabiri said Lagos residents should not make the mistake of reelecting APC in 2019, neither should they also vote for the major opposition Peoples Democratic Party (PDP). However, a former Lagos State Deputy Governor, Alhaja Sinatu Ojikutu, described the current situation in the state as impunity galore, contending that the citizens, rather than former governor Bola Tinubu, are the ones holding the state to ransom. Ojikutu, who condemned how the incumbent governor, Mr. Akinwunmi Ambode, was ingloriously denied a second term ticket by APC stated: “Imagine, a situation where a sitting governor, whom everybody, including the party in power, both state and federal legislators representing the state, local government chairmen and councilors and even Tinubu, adjudged to have performed creditably well, but just three months after, they turned around to deny him second term on the flimsy excuse that he did not do the biddings of some members of the party. The erstwhile deputy governor recalled how Tinubu praised Ambode to high heavens during his 10th anniversary colloquium this year before President Muhammadu Buhari, and the entire world and also endorsed him for second term only to turn around to say the governor is not a party man few months after. Reacting to demands by the Seriki Hausawa that government should provide scholarship and employment for wards, Prof. Osinbajo stated: “Government is not only cognisant of the challenges, but is doing everything necessary to address the issue. The TraderMoni, among other steps taken so far by the President Muhammadu, are targeted at quelling those challenges, noted by the people. Treasurer of Arewa Community in Agege, Alhaji Abdulkareem Abubakar, said they were happy that the vice president decided to pay the leader of Arewa community a visit in Agege, assuring that they will vote massively for APC in 2019 election, because they want continuity of good governance in Lagos State and Nigeria at large. He stated: “We are very happy with Vice President Yemi Osinbajo visit to Arewa Community leaders in Agege. We are excited to see him.